The SLR-A pump is a positive displacement lobe rotor pump designed to transfer abrasive products. 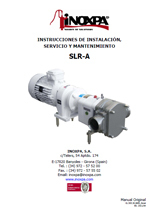 The pump offers high perfromance and reliability. 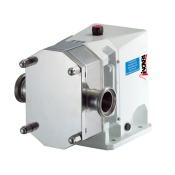 It is characterised by a reduced size, detachable connections and rectangular casing inlet. The SLR-A pump is designed to pump olive mass. The main application is the transfer of the mass from the thermobeater to the decanter and the transfer of alperujo, solid olive-mill by-product, from the thermobeater to the decanter. The SLR-A pump basically consists of two wing-lobe rotors which rotate inside the casing without touching each other. As the rotors rotate, the space between the lobes and the casing is successively filled with the product which is driven to the discharge nozzle displacing a fixed amount of product. The pumped product forms a continuous stream due to the adjusted tolerances between the lobes and the pump casing, thus, ensuring an efficient pumping. Close-coupled construction with elastic coupling. Casing and covers with anti-wear plates. Wing-lobes treated for work with abrasive products. Lobes attached with hexagonal screws. Low maintenance service costs due to the anti-wear plates covering the parts in contact with the product. 90º adjustable casing and inlet/outet. Titre Bomba Lobular Rotativa SLR-A. Résumé La bomba SLR-A es una bomba lobular rotativa de desplazamiento positivo que está diseñada para trasegar productos abrasivos, ofrece altas prestaciones, máxima fiabilidad con unas dimensiones reducidas, sus conexiones son desmontables y la entrada del cuerpo es rectangular. 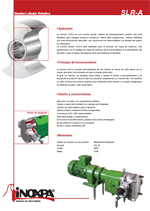 Résumé The SLR-A pump is a positive displacement lobe rotor pump designed to transfer abrasive products. 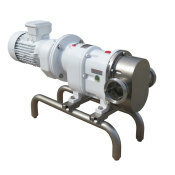 The pump offers high perfromance and reliability. Résumé Este manual contiene información sobre la recepción, instalación, operación, montaje, desmontaje y mantenimiento para la bomba SLR-A. Résumé This manual contains information regarding the reception, installation, operation, assembling, disassembling and maintenance of the SLR-A pump.